Closed yesterday to sob for Bush, Wall Street reopened for business today. It should have stayed closed. 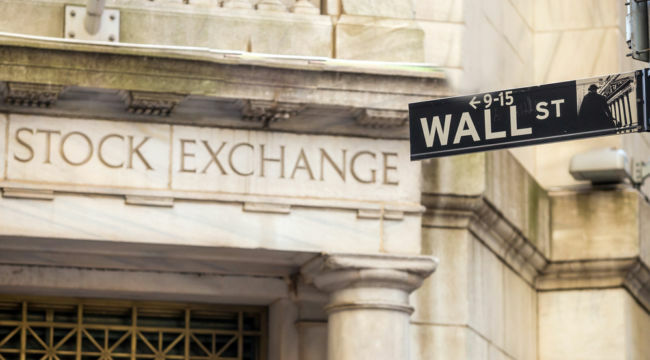 The stock market resumed precisely where it left off Tuesday… when the Dow Jones plunged 799 miserable points. It opened today down another 400 or so — and kept going. Only a miraculous late rally reversed the 780-point spiral… and the index closed just 77 points in red. Both the S&P and Nasdaq followed the same track. The S&P only lost four points by the final bell, while the careening Nasdaq scratched out a 30-point gain. More on this “rally” tomorrow. But this morning the wreckage was extending in all directions, to all points of the compass. The trade war truce may be broken. Someone on the American side drilled a round into the enemy camp. Th06hursday followed the arrest of a prominent Chinese technology executive at the request of the United States, which appeared to dash hopes that a trade war cease-fire reached between the economic giants over the weekend would last. Canadian authorities put the arm on a certain Meng Wanzhou as she was preparing to depart from Vancouver airport. Ms. Meng is the chief financial officer of Chinese technology behemoth Huawei… and daughter of its founder. No charges have been specified as yet. But she has allegedly acted contrary to the laws and interests of the United States. Huawei is China’s largest telecommunications equipment manufacturer. American officials fear the Chinese government may be employing Huawei’s networking technology to spy on American citizens and military personnel. In May the Pentagon banned the sale of Huawei-produced smartphones from its bases — these phones evidently being smarter than the Pentagon would prefer. The firm has also been under investigation for violating trade sanctions on the devil-state Iran. Meng now faces extradition to the United States, where she would stand before the Eastern District of New York. The Chinese Ministry of Foreign Affairs has demanded her immediate release. “It is hard to overstate the symbolism and significance of this event,” says Karishma Vaswani, BBC Asia business correspondent. Huawei is the crown jewel of Chinese tech and Ms. Meng is effectively its princess. Even though it’s still not clear what the charges against her are… this is not simply a case about the arrest of one woman, or just one company. This arrest could materially damage the relationship between the U.S. and China at possibly one of the most sensitive times between the two countries in their long and torrid history. If we did not know any better, we might suspect treachery is afoot. For months these questions have been raised. Are agents of the United States government actively undermining the cease-fire? But who? And for what purpose? But let us return to our sober senses, put away our hat of tinfoil… and return to the topic under discussion. Now you have your reason for this morning’s fireworks. Despite today’s late rally, perhaps another will surface tomorrow. The stock market is a wreck of nerves these days… like a man walking point in a dark enemy jungle. A leaf rustles, a bird scatters, a lizard scurries — and he hits the deck. How many times have stocks hit the deck since October? Single-day losses of 300, 500, 700 — 800 points — seem almost commonplace now. Ned Davis Research sorts asset classes into eight separate piles. From domestic and international stocks, to bonds of all stripes, to commodities and many things else, it follows them all. Not one of these assets is on the track for a return of more than 5% this year, they claim. Not since 1972 — 46 years ago — have these assets put in a year of such combined futility. Nothing’s working — not large- or small-cap stocks in the U.S., not international or emerging equities, not Treasuries, investment-grade bonds, commodities or real estate. Most of them are down, and the ones that are up are doing so by percentages in the low single digits. Put away the trade war for the moment. 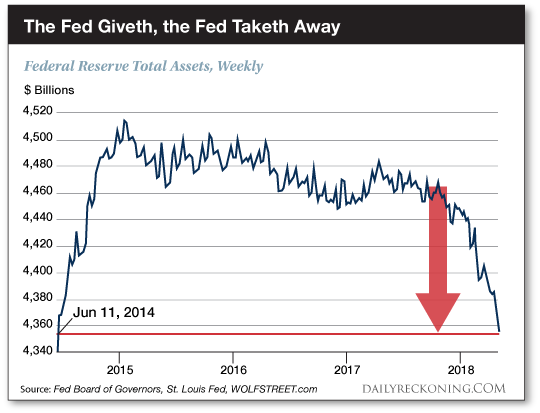 As the chart reveals, the Federal Reserve is draining its balance sheet at a clip — a clip only scheduled to accelerate. The other major central banks are falling in behind it. There, the picture worth a thousand words. But for the Dow Jones, maybe a picture worth a thousand points — and probably much more.